This spring the Old Gold Mine Hermitage, near rural Republic, Washington, was the site of what for the locals must have seemed an unlikely work party. Old Gold Mine Hermitage owner-manager Roger Fox, on right, gives the nuns tree-planting instructions. For five days Buddhist monks and nuns joined lay practitioners to help restore a part of the hermitage forest that was lost to fire in 2010. The monks were there for the full five days, and the nuns arrived for the last day only. The monks came from the Abhayagiri Monastery in Redwood Valley, California, and also from the Pacific Hermitage along the Washington-Oregon border near Portland. The nuns arrived from Sravasti Abbey in Eastern Washington north of Spokane. The Old Gold Mine Hermitage is a beautiful property in the spectacular hills near Sherman Pass. Owner-manager Roger Fox offers the hermitage for serious meditators —ordained or lay of any tradition—and Abhayagiri monks have accomplished retreat there. The tree planting teams at work. Four years ago the hermitage endured a fire that started from a neighbor’s overturned barbecue. During the fire the hermitage lost much of its forest, although Fox’s home, the hermitage kitchen, service building, and the four meditation huts were spared. 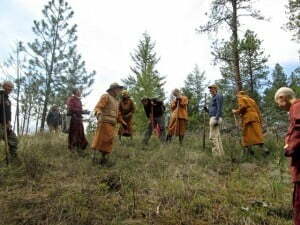 The Abhayagiri monks had come from the Portland area, with a group of trainees called anagarikas and lay supporters, to help re-forest the land. The decision to help was easy, because Abhayagiri and Sravasti Abbey already practice forest management on their own properties. 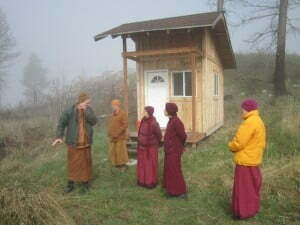 Tan Khemako (left) and Ajahn Jotipalo show the nuns a kuti—a meditation hut—on their retreat property. From left to right the nuns are Ven. Chonyi, Ven. Damcho, and Ven. Samten. 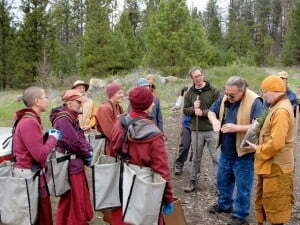 Sravasti nuns also work in the forest, to minimize fire danger at the abbey’s 240-acre property. Tree planting, however, is not an activity normally associated with monastic life. The Vinaya – the monastic ethical code – prohibits monks or nuns from digging in the dirt. But the Abhayagiri team used an ingenious three-person-team planting method to get the job done, while not violating the Vinaya. Monks, nuns and anagarikas together. To do this one lay person scarified the soil’s surface, a second lay person dug the hole, and a monastic placed the tiny baby tree, carefully refilling the hole and tamping the dirt all around. The Abhayagiri team planted nearly a thousand trees during their five-day stay at the hermitage. We nuns arrived for the last planting day, helping to place 180 trees in about an hour. We also enjoyed a tour, a delicious meal, a beautiful hike, and a rich dharma sharing. The next day, a contingent of Abhayagiri monks and lay friends, including Abbot Ajahn Passano, made the drive east to visit Sravasti Abbey. 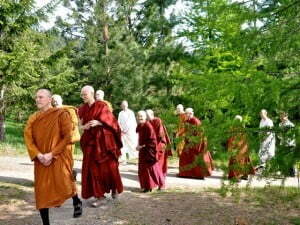 Ajahn Passano leads the walk to the Chenrezig Meditation Hall at Sravasti Abbey. 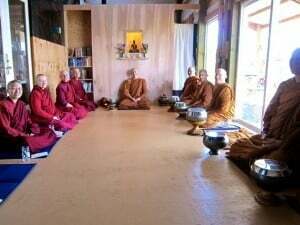 After a tour of the abbey garden, buildings, and the new, soon-to-be consecrated Chenrezig Hall, the abbot accepted our invitation to give a short teaching to the assembly. “It’s really worthy of delight to see the effort and the dedication that’s been put into this place, and recognizing that this is something that will bring blessings for a long time to come,” he told us. A monastic gathering before lunch is served in the new hermitage prayer hall. This kind of cross-tradition exchange would have been unimaginable in Buddhism’s past. In Asia, oceans, mountains, thousands of miles, and diverse languages separated these practice traditions. 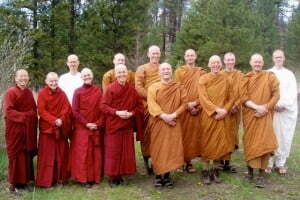 In addition, these brown-robed monks from Abhayagiri practice in the Theravada tradition, while the maroon-robed nuns from Sravasti practice in the Mahayana tradition. The philosophical differences between these two principal schools of Buddhism have been the subject of debate for centuries. One great benefit of the dharma coming to the melting pot of America is the opportunity it affords for different Buddhist traditions to know one another. And, according to Bhikshuni Thubten Tarpa of Sravasti Abbey, these two groups have much in common. Abbey nuns say farewell to Abhayagiri Abbot Ajahn Passano. In gathering, sharing work and meals, and dharma conversation, we reinforced what we already knew: Buddhist monastics of all traditions share a commitment to live and practice the Buddha’s teachings, in accordance with the Vinaya. We all take refuge in the three jewels and rely on the Buddha’s four noble truths as our foundation. Western Buddhist monastics are still few in number, and the chance to meet and learn from each other is precious. 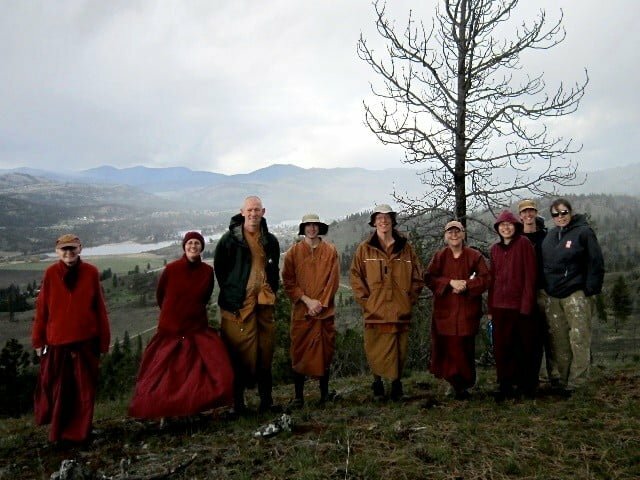 We met in the “mahasangha” spirit that is promoted, supported, and exemplified by the Northwest Dharma Association: Through exchanging ideas and dharma friendship across Buddhist traditions, we believe that we enrich and deepen the soil and the roots of dharma in the U.S.